Millington Fire Chief Gary Graves was on the scene last Thursday at the Tennessee National Guard after shots were fired. The Millington Fire Department joined other agencies like the Millington Police, Navy Police and Shelby County Sheriff’s Department in securing the location. In the hours following the shooting at the Tennessee National Guard in Millington last Thursday, members of the Guard flew into Flag City from Nashville. 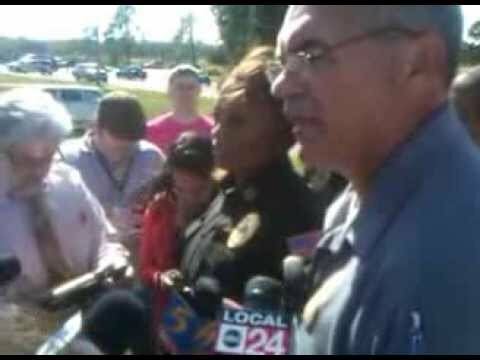 The Tennessee National Guard held a press conference just feet away from the shooting. More details were released and a clearer picture started to appear. A recruiter wounded two of his superiors on Thursday when he opened fire with a handgun. By the end of the night, the shooter was identified as Sergeant First Class Amos Patton of Cordova. With the incident being investigated by the FBI and NCIS, Patton was accused of shooting his commanding officers and grazing a third officer. According to witnesses at the Paul R. Summers Armory, Patton was wrestled to the ground to gain control of the situation. Maj. Gen. Terry M. Haston, the adjutant general of the Tennessee National Guard, explained the ranks of all involved in the shooting Thursday night. The victims, a major and a sergeant major, were in the chain of command of Patton. The victims, veteran recruiters, were each shot once in their lower extremities and taken to the Regional Medical Center in Memphis. They have since been released from the MED. Patton was charged with assault of federal property and carrying and using a firearm during a federal crime of violence after the incident. According to the FBI, Patton went to his car in the middle of his meeting and retrieved government-issued gear to return it. When he came back to the meeting he had a fanny pack, which he previously did not have. Then Patton is accused of shooting nearly 10 rounds from the handgun. The gun fired at Maj. Jeff Crawford striking him in the thigh. He has an entrance and exit wound. A bullet hit Sgt. Maj. Ricky R. McKenzie in the foot. Lt. Col Hunter was grazed by a bullet right below the knee, according to the National Guard. Patton was ordered to be held without bond. A bond hearing is set for Wednesday. Patton is charged with four counts of unlawfully attempting to kill Major WJC, Sergeant Major RRM, Lieutenant Colonel HLB, and Sergeant Major CTC while they were in performance of their official duties. Patton is also charged with four counts of assault with a deadly weapon on each of the four individuals, and further charged with one count of using and carrying a firearm during and in relation to a crime of violence. If convicted, Patton could receive up to 20 years in prison for each charge of unlawfully attempting to kill and up to 20 years for each assault charge. He also could receive a minimum of 10 years for the firearms charge. There is no parole in the federal system. This case is being investigated by the FBI and the NCIS. Assistant U.S. Attorney Fred Godwin is representing the government. The charges and allegations contained in the indictment are merely accusations, and the defendants are considered innocent unless and until proven guilty.